How Long Does It Take to Grow Geraniums? Geraniums are among the most popular flowers for home gardeners. Each spring and summer the aisles of garden centers are filled with every color and type of geranium for sale. Though often grown as annuals in the garden, geraniums will also thrive as houseplants with proper care and may be wintered inside and returned to the garden in the spring. Geraniums are prized for both their colorful blossoms and varied foliage. Work the soil after frost danger has passed if you are planting the geranium in the ground. Add at least 1 inch of compost to the top of the soil and work it into the dirt with the spade to improve the drainage, if necessary. Fill containers with potting soil if you are planting the geranium in containers. Dig holes that match the size of the geranium plants and remove the plants from their temporary pots. Place the geraniums into the prepared holes so that they are at a slightly shallower level than they were in the temporary pots. This will help keep the stem from decaying. Replace the soil around the geraniums carefully and water the newly planted geranium generously. Fertilize geraniums growing in containers and in flowerbeds once per month with a balanced fertilizer, following package directions for proper amounts. Cut off blossoms when they are finished blooming to improve the plant’s appearance and to help keep the geranium healthy. Apply 2 pounds of 10-10-10 or 4 pounds of 5-10-15 fertilizer per 1,000 square feet for outdoor geranium gardens. Apply in the spring, and apply a second, half dose, in late July. Apply water to the dry fertilizer in outdoor gardens to sink it into the soil. An alternative to the dry fertilizer in outdoor geranium gardens is to use 2 level tsp. of water-soluble 20-20-20 fertilizer in one gallon of water and apply every 3 weeks. Do not use both dry and water-soluble in the same garden. Apply fertilizer to indoor geraniums sparingly. Indoor soil mixes of 1 part soil, 1 part sand and 1 part peat will not require fertilization until after 3 months. Use 1 tsp. of 20-20-20 water-soluble fertilizer mixed into 1 gallon of water after the three-month period and apply again every two months. Fertilize during growing periods only. Fill small, clean pots with vermiculite or a packaged rooting medium and water. Take 4-to-6 inch long cuttings from a healthy scented geranium plant. Cut the end right below a leaf node. Remove the lower leaves from each cutting. leaving at least 2 inches to insert in the container. Place the cuttings, one to a container, in the planting medium so that the leaf nodes are submerged. Water the cuttings thoroughly. Place the containers in a light, warm spot away from direct sun and keep them moist while the cuttings root (four to six weeks). Move the containers to a full-sun location when the roots start to grow. Water the seedlings when dry. Move the new plants to larger containers, or plant them in the ground when new growth starts to appear. These South African natives will grow in most any garden with minimum care.Colors range from white, subtle pinks and brilliant reds to purplish black. In Zones 9-10, geraniums grow outdoors from year to year with little attention and become shrubby plants 4 to 5 feet tall, but in frost zones they are grown as small, delicate annuals. Geraniums can be grown in containers and brought indoors during the winter. Ivy and common geraniums make superb bed, border and pot plants because they bloom throughout the garden season. The trailing stems of ivy geranium make it particularly effective in window boxes and hanging baskets or as a flowering ground cover. The Martha Washington is a less successful summer-flowering plant in many sections of the country since it needs temperatures below 60° to bud. It is often grown by florists as a flowering pot plant for Mother's Day and Memorial Day. Home gardeners usually buy geraniums as budded or flowering pot-grown plants ready to set into the garden. Most plants are raised from cuttings since common geraniums take five months to flower from seed. To start plants from seed, sow seeds indoors eight to 10 weeks before the last frost is due. Young seedlings should be transplanted into 2-inch pots when the first true leaves appear and shifted to 4-inch pots as they become larger. Keep the pots on a sunny window sill. The seeds germinate unevenly over a period of three to eight weeks. Transfer them to the garden outdoors after the danger of frost is past, setting them about a foot apart. When growing ivy geraniums in garden beds, place the plants 12 to 18 inches apart and pin the stems down with bent pieces of wire to train them to grow close to the ground. Most geraniums thrive in climates with dry summers, warm days and cool nights. They do best in full sun but grow well in partial shade if they have sun at least half of each day. The soil should be well drained and only medium rich. Plant geraniums in soil rich in organic matter. A 2- to 3-inch layer of well-rotted manure or compost improves drainage and provides nutrients to growing plants. Fresh manure robs the soil of nitrogen as it decomposes and should be avoided. Apply slow-release or water-soluble fertilizer with a balanced formula like 10-10-10 or 8-8-8 once a month. Fertilizers high in nitrogen (the first number in the formula of fertilizer) produce lush foliage but often inhibit blooming. Dilute fertilizer to 1/4 to 1/2 strength for geraniums grown as houseplants and apply every two weeks to provide a steady source of nutrients. Geraniums take from twelve to sixteen weeks from the time the seed is planted until the plants begin to bloom; start seeds indoors in January. 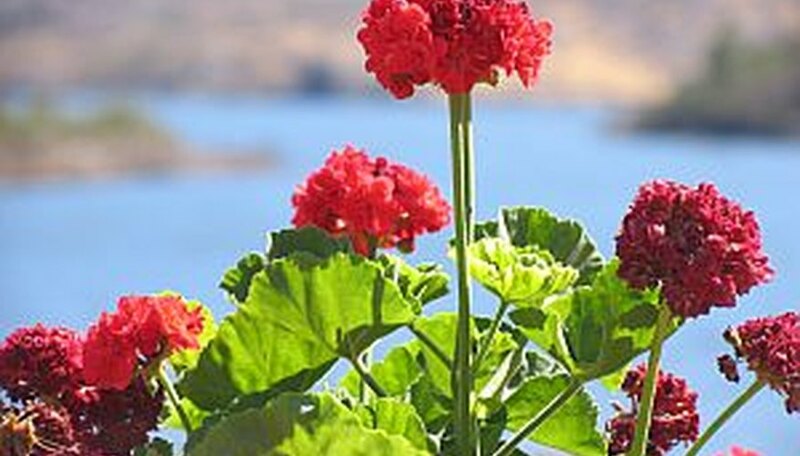 Plant geraniums, formally known as pelargoniums, at least 12 inches apart in a sunny location with well-drained soil. These plants also thrive in containers. True geraniums are perennial flowers, which means they grow back year after year. These varieties are very cold hardy. They grow well in USDA hardiness zones 4 through 9, which covers most of the United States. Annual varieties are not true geraniums and are not considered cold hardy. Watch your flowering geraniums for signs of the flowers drying and the petals starting to drop. Once the seed heads appear dry, they are ready to be collected. Hold your bag open under the seed heads of your strongest plants as you use the pruners to cut the stem of the geranium. Let the dried seed head fall down into the paper bag. Take your collected seed heads inside and place the bag in a warm and dry area. Leave the seed heads in the bag for two weeks to finish drying. Shake the bag every few days to loosen the dried seeds inside the seed heads. Pour the contents of the bag into a large bowl. Sort through what’s in the bowl and pull out the empty seed heads and discard them. Spread the loose seeds out in a single layer on a paper plate and allow them to dry for an additional week before storing in an envelope or jar in a cool, dark place. Strawberry geraniums, evergreen plants, grow 6 to 8 inches tall, and have a spreading, mat-forming habit. Its gray-green leaves are rounded to heart-shaped, with silver veining and hairy texture. North Carolina State University extension describes the undersides of leaves as purplish-maroon with long, pink hairs. Strawberry geraniums produce 1- to 2-foot, thin stems that bear small, white, five-petaled flowers. Strawberry geraniums may be used as ground cover plants or in rock gardens, hanging baskets, window boxes or other containers. This species also sees use as a houseplant. Strawberry geraniums prefer shade conditions and moist, organic, well-drained soil. This plant is not drought tolerant and is suitable for USDA zones 7 to 10. Propagate strawberry geraniums by division of the plantlets that form at the ends of stems. Indoors, strawberry geraniums like bright, indirect light and cool, moist conditions. Feed monthly with a commercial houseplant fertilizer. Saxifraga stolonifera cv. Tricolor, also known as magic carpet, is a variegated type. 'Maroon Beauty' produces rounded reddish leaves, silvery veins and red stems. Saxifraga species may be bothered by aphids. Use insecticidal soap, available at most garden centers, for control. 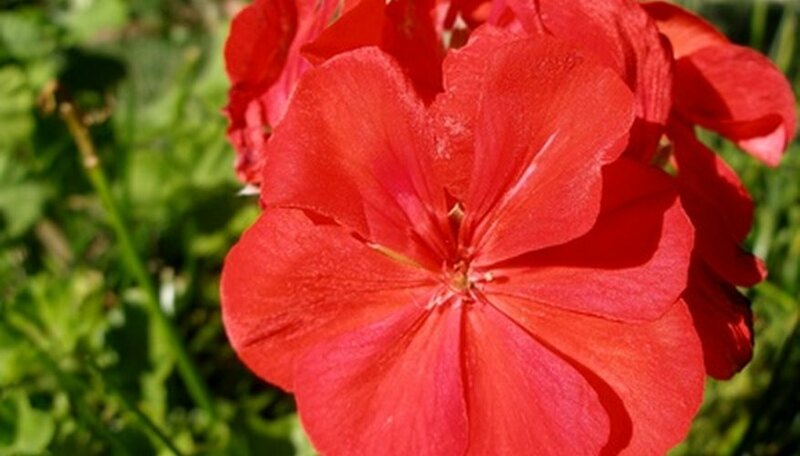 The red color that gave the plant the nickname red fox geranium is most vibrant when the plant grows in sunny areas that periodically become dry. When the plant grows in moist, shady areas, the leaves stay green through the summer. This species of geranium got the nickname Stinky Bob because the crushed leaves give off a musky smell. If left intact, the plant does not have this odor. In Washington state, the U.S. Department of Agriculture classified red fox geranium as a noxious weed. It is not native to the area and is encroaching on native species. In Maryland, the red fox geranium is endangered. In Indiana, it is a threatened species. Geranium robertianum has shallow roots and blooms with pink flowers, which have five petals each. The leaves are light green and the stems have brittle joints.